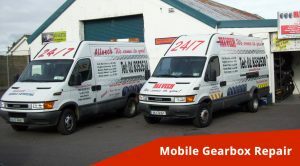 With years of experience, we are Blanchardstown’s premier mobile gearbox mechanics. We specialise in “on­ the­ go” gearbox repairs & service to your car, van or truck, wherever you are. This means we can come to your location if you need a gearbox check or fast repair completed 24 hours a day. I had Shane from Allvech come out to my home in Blanchardstown to repair my Gearbox. Leaving to the last minute wasn’t clever, but needless to say he got my car up in running in no time.